HE keeps getting individual accolades, but Jimmy Alapag is more concerned about achieving team goals. A triple halfway through the first quarter in Game Three of Talk ‘N Text’s PBA semifinal series against San Miguel Beer on Tuesday moved the Tropang Texters star point guard to solo second all-time in the three-pointers list, surpassing Ronnie Magasanoc and closing in on Allan Caidic. But keeping count is the last thing on his mind. “I’ve never looked at my career to chase records,” said Alapag, who has also recently been included in the league’s 40 Greatest Players list. “I think as a basketball player, you try your best to prepare to perform the best you can to help your team win as much as possible. 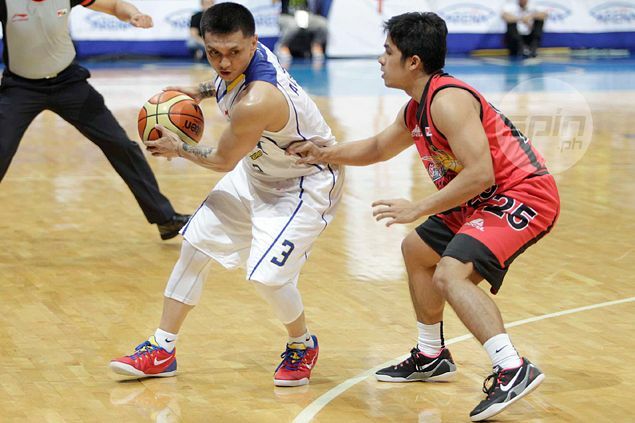 Besides, Alapag is focused on helping the Texters climb from the hole they’ve fallen into in the best-of-seven series. “It’s tough to concentrate on it, because we’re in the middle of a semis series. But any time you can be mentioned with guys like Allan Caidic and Ronnie Magsanoc, that speaks for itself,” he was quick to add. Alapag just needs 71 more conversions from beyond the arc to become the all-time leader after increasing his tally to 1,172. “To be mentioned in their company is absolutely a huge honor. It also says I’ve been playing a little while,” the 11-year PBA veteran said. The former league MVP said he will have more of an appreciation of the honor once he hangs up his sneakers for good.